It may not feel like it, but WordPress is ultimately a piece of software like any other. The only reason it doesn’t feel like a regular piece of software is that it runs on your server meaning you’ll never get to interact with it like you would do another program. For all extents and purpose though, this is simply like installing and using any other program be that Word on your PC, Adobe Illustrator or perhaps a computer game. 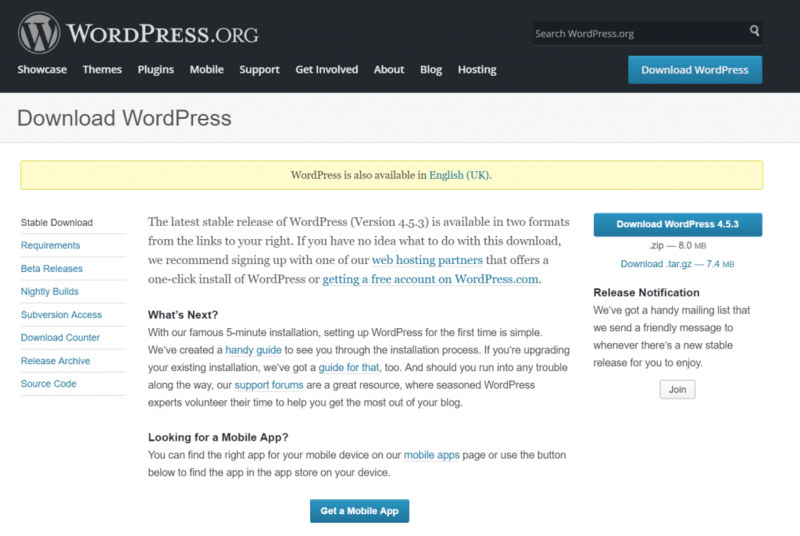 And just like any other program, WordPress is sometimes going to need an update. Over time, new features and options come to WordPress and to get involved, you then just need to go ahead and go through the update process. So how do you go about this process and why is it so important? As ever, we have you covered. Read on! If you don’t keep your version of WordPress up-to-date, then you’re going to miss out on lots of new features as they come out. 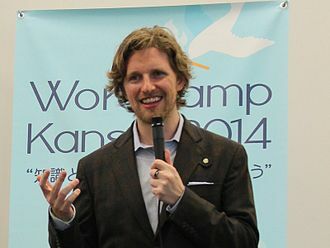 Matt Mullenweg and his team and constantly working on new updates for the system to help make life easier for creators and to ensure that the experience only keeps getting better. These are small iterative changes but they really do add up. What’s more, is that this will improve the experience from the users’ perspective too. Keeping your site updated will ensure that it loads as quickly as possible, that you experience minimum downtime and that everything looks and operates as it should. But that is not really why you need to keep WordPress updated. The reason you need to keep WordPress updated is that this is the best way to keep your site secure. Millions of websites have WordPress running behind the scenes and this makes WordPress a very appealing target for hackers. If they can crack WordPress itself, then they can crack half the websites out there! The good news is that WordPress is incredibly easy to update – just like everything else, the process has been streamlined to the point where it’s pretty much seamless. To go ahead and do that, all you need to do is to look for the little sign at the top of your WP Admin panel asking you to update. Then just click on ‘Please Update Now’ and you’ll be taken through the necessary steps. What you’ll notice here though, is that there is a little warning telling you to backup your ‘database and files’ before you go ahead with the update. Do you have to do that? Of course it’s up to you! Chances are that this update will go very smoothly and there will be no need for you to update anything. But things do go wrong from time to time and that includes things going wrong on WordPress! If you are particularly unlucky, then your installation might crash halfway through or some problem with your current database or your current plugins could cause a problem. This is why it’s always a good idea to back up your WordPress site first. Fortunately, we have a post telling you how to backup your WordPress site in detail, so go and check that out! The basics you need to know though, are that backing up means backing up both the MySQL database and the individual files. You can do both these things manually, or using a number of free and paid tools and services. Very often, you’ll find that your hosting account comes with certain backup utilities included, while in other cases you might opt to install a separate plugin to handle it. Otherwise, you can move the files across to your PC and then backup your database through cPanel. Depending on how careful and thorough you want to be, you may also decide to take the extra precaution of uninstalling all your extra plugins and widgets. This can help to reset WordPress essentially back to normal, which helps to remove any factors that might go wrong. Of course this is an extra hassle though, so it’s your call if you think this is a good idea/necessity. But what if you aren’t given the option to update WordPress this way? In that case, you’re going to need to do a manual update. You may also need to do this if you’ve made a lot of alterations to the core files. To do this, you will again need to back everything up and then remove all plugins. Once you’ve done that, you can then download the very latest version of WordPress by going to WordPress.com/download. Once you’ve done this, you’re ready to install the new version. So simply extract the files and then upload them to the correct folder on your site. 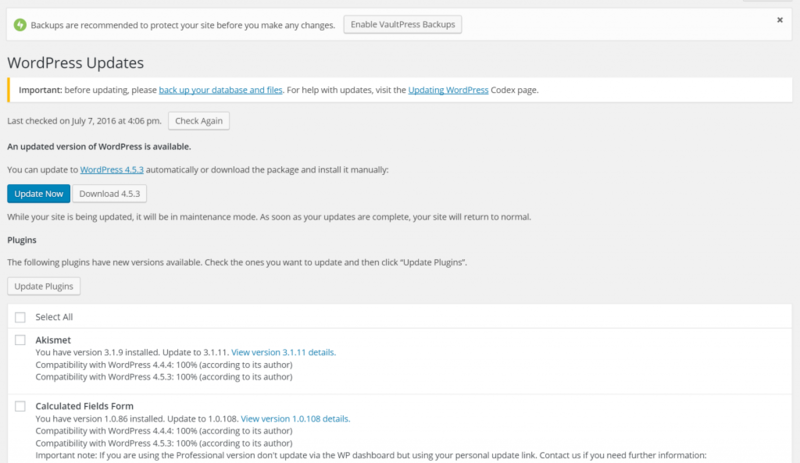 Now run the WordPress upgrade program by simply navigating to it through the browser. You’ll be walked through the different steps on the screen. Once that’s done, you can update the permalink structure and .htaccess. Reactivate your plugins and you’re good to go! While that may sound a bit complicated, the good news is that 9/10 people won’t need to worry about it. Rather, just backup your site and then click ‘update’. Note that you also need to do the same for individual plugins and doing so can further help you to protect your site from malicious attacks. Stay vigilant!